22 LONGISLANDPRESS.COM • JULY 2018 36 THE QUEENS COURIER • JUNE 21, 2018 FOR BREAKING NEWS VISIT WWW.QNS.COM Transparency is important when you’re borrowing money for your small business. You need the right information to make an informed decision. When different lenders quote different rates and fees, it’s hard to compare offers. That’s why OnDeck launched SMART BoxTM – an innovative capital comparison tool. SMART Box lays out your rates and fees so you can easily understand your loan offer before signing. If you’re looking for small business financing, you can trust OnDeck. 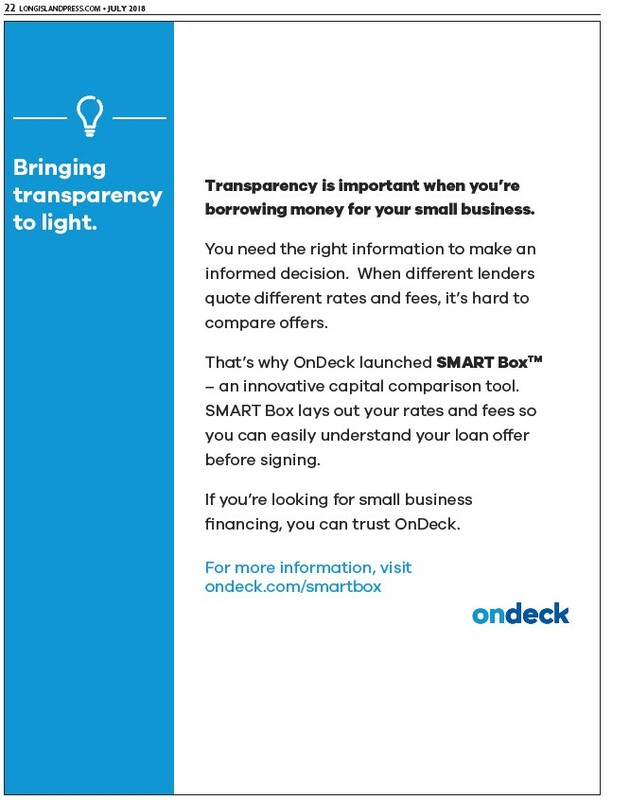 For more information, visit ondeck.com/smartbox Bringing transparency to light.